Warwick Castle, in Warwickshire will be launching a new interactive show this year which will tie in with the school History curriculum. The Falconers Quest show is launching 6th April to 31st October and is among many other educational offerings at the attraction. 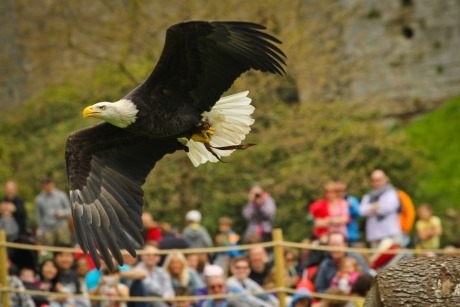 Said to be the UK’s largest bird of prey show, The Falconer’s Quest at Warwick Castle will be available for schools to experience as part of the ticket price from Easter. During the show, students will be able to search the skies overhead as free flying birds of prey take part in an all action dynamic display of aerial acrobatics. Pupils will learn about the incredible birds as they join the ‘Medieval’ falconer on a quest for the finest birds in the world. It will tie in with History studies, teaching children about the role of the Medieval falconer. The show is set on the riverside location within the grounds of the castle. A number of workshops are available for all Key Stages. For Primary students, a Meet the Monarchy session will link with History and include a guided tour, hearing gory stories behind England’s kings and queens. For Secondary students, The Kingmaker session, will teach you about the secrets of the Medieval battlefield as well as the life of workers and women at the court. Whether you’re studying the Normans, Medieval Fortresses, the British Monarchy, Crime & Punishment or more, there’s plenty to keep your class entertained when visiting. Teachers can email education@warwick-castle.com or call 08712 222772 (charges apply) for more details on school bookings. For more information, visit www.warwick-castle.com/schools/.